These kittens have names, but wait! A couple of weeks ago, I asked for help naming our two rescue kittens. We had taken in two 4 week old kittens whose mother had been killed and we were at a loss as to what to call them. Despite all the great suggestions from GT'ers, we eventually settled on Dunwich and Pickman. If you're horror fans, you might recognize these as references to two separate H.P. Lovecraft stories, because, well, have you met me? So thanks for all the great suggestions! The kittens are doing fantastic. They're weaned, they've gained weight, and I think we've conquered the flea situation. They're adorable love bugs who enjoy burrowing down my shirt and sleeping in my cleavage, which is really cuter than it might sound. In fact, Pickman has set up residence there now. 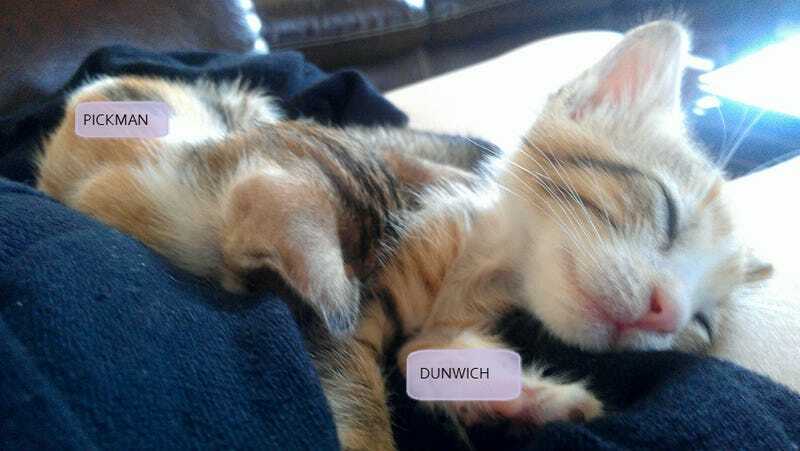 Dunwich has draped himself around my neck. Gee, Slay, there seems to be one too many kittens in this picture, you're not saying to yourself. Well, yes, yes there is. Apparently word has gotten around the neighborhood — which is a trick because none of the neighbors speak to me — that I'm a soft touch. One of the neighbors's drivers showed up yesterday and summoned me to another abandoned kitten. She's a dirty, mangy thing, but she was so happy to see me and purred like a motorcycle when I picked her up. I estimate she's a couple of weeks older than the boys but it's hard to be certain because she's really emaciated. She's gotten a bath, a vet visit and some antibiotics, and I'm well on my way to being the weird American cat lady.